Get Nostalgic at our Vintage Rose Valentine’s Market (2/10): Flower Crown Making, Rosewater Gimlets, Live Music, Nail Art, Photo Booth, & More! Prepare to fall in love… with 60+ local vendors! The Vintage Rose Valentine’s Market is happening Sunday, February 10 from 1-7pm, and we’re already feeling kind of dreamy. You’ll be transported to a simpler time… A time before swiping right and sliding into DMs, when the art of hand-writing a Valentine was alive and well. 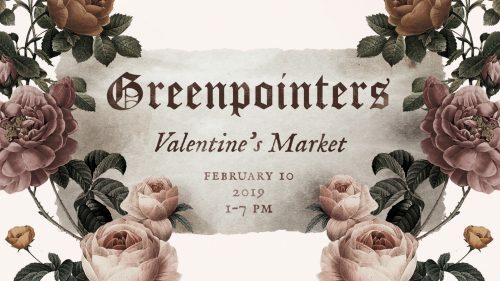 The Greenpoint Loft (67 West Street) will be cast in a rosy glow with perfect Valentine’s Day gifts of every variety. RSVP HERE!